In 12-inch nonstick skillet, cook sausage over medium heat, stirring frequently, until browned and no longer pink. Remove sausage from skillet; drain on paper towels. Wipe skillet clean with paper towels; set aside. Meanwhile, in medium bowl, lightly beat eggs, 2 tablespoons sour cream, the half-and-half and taco seasoning mix with wire whisk until well blended. In 10-inch nonstick skillet, melt butter over medium heat. Add egg mixture; cook 2 to 4 minutes, stirring frequently, until mixture is very moist. Stir in cooked sausage, 2 tablespoons chives, 2 tablespoons cilantro, the tomato and chiles. Cook 1 to 2 minutes longer or until egg mixture is set but still moist. Remove from heat. Place tortillas on work surface. Top half of each tortilla with 2 to 3 tablespoons egg mixture; sprinkle each with 1 tablespoon of each of the cheeses. Fold untopped half of tortillas over egg mixture. Heat same 12-inch skillet over medium heat. Place 2 quesadillas in skillet; cook 30 to 45 seconds on each side or until crisp and lightly browned. Remove from skillet; place on serving plate. Repeat with remaining quesadillas. With pizza cutter or sharp knife, cut each quesadilla into wedges. Top each serving (2 quesadillas) with about 1/2 tablespoon each of chives, taco sauce and sour cream. You no longer have to wait until noon to eat quesadillas! This yummy breakfast quesadilla breaks from the traditional eggs-and-toast meal you’re used to and serves up a dish that flavorful but still easy. Plus, it’s no secret that eating breakfast has been shown to improve mental alertness and physical performance, so why not enjoy every bite? With a mix of Old El Paso™ taco seasoning and chopped green chiles, sour cream and gooey cheese this recipe has a nice balance of flavors. These quesadillas are topped with chopped fresh chives, taco sauce and sour cream to tempt your taste buds for another serving. 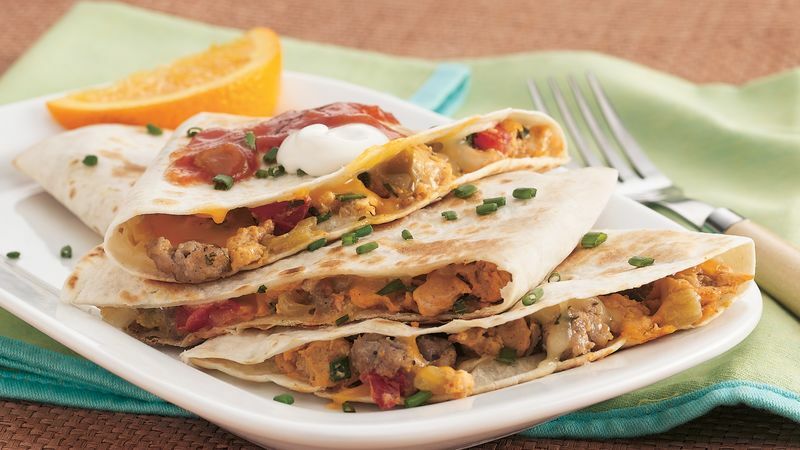 Want to expand your quesadilla menu? We’ve got a whole list of quesadilla options for you to choose from.